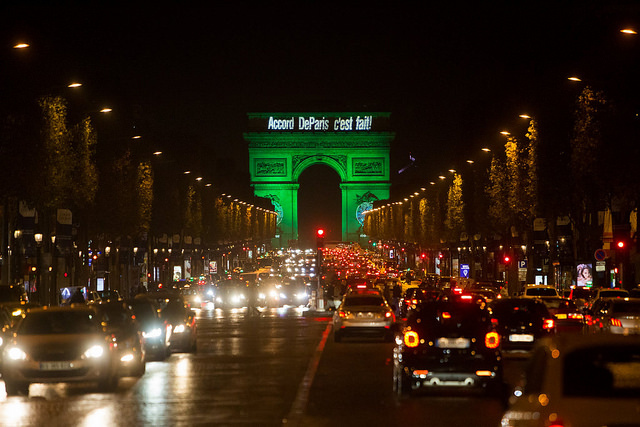 The Arc de Triomphe in Paris, France, is illuminated in green to celebrate the entry into force of the Paris Agreement, the most ambitious climate change agreement in history, on November 4, 2016. [Photo by Jean-Baptiste Gurliat/ Mairie de Paris] . U.S. Department of State. On June 1, 2017, President Trump made it official: the United States would be withdrawing from the Paris Climate Accord. The 2015 Accord is an agreement among 195 countries to strengthen the global response to the threat of climate change by keeping a global temperature rise this century well below 2o C above pre-industrial levels, and to pursue efforts to limit the temperature increase even further to 1.5o C. Scientists believe the earth will be locked into a future of severe droughts, floods, rising sea levels, and food shortages if these thresholds are exceeded. While not a surprise, given the President’s outright denial of climate change, the decision to leave the agreement outright angered world leaders and the global environmental community. Rapidly-increasing atmospheric concentrations of greenhouse gases have reached levels of 409ppm, dangerously above the 350ppm that is the generally accepted threshold to ensure a livable planet. And while all but two countries are signatory to the agreement (Nicaragua who said it didn’t go far enough, and war-torn Syria), the White House is doubling down on the use of carbon-emitting fossil fuels – known to be a primary driver of our changing climate – and turning its back on the rest of the world. In exiting the accord, Trump declared that the U.S was being asked to bear too great a share of the costs for carbon reduction, and that compliance would mean economic loss and diminished quality of life for U.S. residents. It is clear that he chooses to ignore the clean energy industry that is creating U.S. jobs. According to a recent Sierra Club analysis of Department of Energy 2017 Jobs data, jobs in solar, wind, energy efficiency, smart grid technology, and battery storage outnumber fossil fuel jobs by a factor of 2.5 to 1. And, when it comes to coal and gas, clean energy jobs outnumber employment in the coal and natural gas industries by a factor of 5 to 1. With his exit from the Paris Agreement and a rollback of Obama-era carbon reducing policies, Trump is favoring fossil fuels that produce fewer jobs, pollute our air, poison our water, destroy our land, and contribute to the warming of our planet. Trump’s plan, not the Paris Agreement, is the one that will diminish quality of life for U.S. residents. Donald Trump’s decision to pull the United States from the landmark Paris Agreement drew anger and condemnation from world leaders and industry. News reports anticipating the withdrawal claimed the U.S. would fall far short of meeting its pledges, and that Trump’s withdrawal would jeopardize the entire Agreement.But the day President Trump announced withdrawal, some amazing things began to unfold. As United States governors and mayors, we oppose today’s decision to withdraw the U.S. from the Paris Agreement. The U.S. cannot address climate change on its own. Participation in the Paris Agreement, which includes nearly every country, ensures that the efforts to reduce greenhouse gas emissions already underway across America’s states and cities are part of a larger global effort. Withdrawal only undermines our efforts. We remain as committed as ever to working with our partners around the world to implement the Paris Agreement and achieve our shared goals. And we will continue to enlist like-minded cities, states, regions and countries to join in this fight. Within a week, more than 1400 cities, states and businesses across the country had pledged to meet or exceed the Paris commitments. This includes 247 mayors from nine of the 10 largest cities in the country – New York, Los Angeles, Chicago, Houston, Philadelphia, Phoenix, San Diego, Dallas, and San Jose. These cities, large and small, in 42 red and blue states, represent more than 59 million Americans. We will intensify efforts to meet each of our cities’ current climate goals, push for new action to meet the 1.5 degrees Celsius target, and work together to create the 21st-century clean energy economy. The world cannot wait—and neither will we. And on Saturday, June 10, 2017, Reuters reported that German Environment Minister Barbara Hendricks announced Germany is teaming up with California to work on tackling climate change. Now Europe’s largest economy and the largest state economy in the U.S. will back the work of the Under2 Coalition, which represents 1.2 billion people and $28.8 trillion in GDP. At this time in our country’s history, the Paris Agreement could be stronger without the United States. Rex Tillerson, former CEO of Exxon Mobil and supporter of Donald Trump’s fossil fuel policies, would have had veto power. And had the U.S. decided to stay, the American public might have become complacent. Instead, state and local governments angered by Trump’s withdrawal, are proactively seeking alternatives to ensure the pledges made by the United States as part of the Paris Climate Accords are met or exceeded. Illinois is not part of the U2 Coalition. And as this article is being written, Governor Rauner has not yet signed a statement pledging to meet the Paris commitments, although organizations are now mobilizing to ensure that he does. But last December, Illinois became a clean energy leader by adopting the Future Energy Jobs Act, one of the the most comprehensive climate bills in the country, with bipartisan support. As a result, Eco-Justice Collaborative has teamed with Prairie Rivers Network, Delta Institute, Illinois Environmental Council, and the Sierra Club, Illinois Chapter to leverage the resources of the Future Energy Jobs Act (FEJA) in central and southern Illinois. This part of our state is experiencing severe job losses due to the closing of coal plants, mechanization of the mining industry, and changes in markets as natural gas, wind, and solar become more cost-competitive than coal. Not without its flaws (the nuclear energy bailout among them), the FEJA will make available $200 million per year to build new solar, wind, and energy efficiency projects in Illinois. It will create the first community solar program, allowing residents to subscribe to a shared project; establish the Illinois Solar for All program, directing funds into low-income areas for community solar projects and job training; and set new standards for energy efficiency, allocating $25 million per year for programs that help low-income homes become more efficient. Collectively, these programs and financial resources will create good-paying jobs and prepare a workforce with skills that can compete in today’s new energy economy. Our coalition’s work is just an example of what is taking place across the state as community leaders, faith groups, businesses, and organizations work with the clean energy industry to use this bill as a means to cut Illinois’ carbon emissions in half by 2030. Trump may have pulled the U.S. out of the Paris Climate Agreement, but an energy revolution is underway that even he can’t stop. Take time to celebrate! But in so doing, realize that there are no guarantees that this new revolution is enough to stop a climate catastrophe. We all must continue to find ways to work locally and collaboratively to combat our rapidly changing climate – and protect this beautiful planet we call home. By Pam & Lan Richart, Co-Directors of the Eco-Justice Collaborative, a local non-profit that uses education, advocacy and action to address urgent environmental issues, while integrating their work with ongoing struggles for social and economic justice. Been trying to find you for years.